For use in your Whirlpool/ Hot tub/Spa as a deep clean flush cleaner. The AquaFinesse SpaClean Puck product cleans thoroughly removing debris and calcium from inside piping and pumps. A clean system ensures easy maintenance and reduces the need for harsh chemicals such as surface cleaner, etc. Your Spa will need to be emptied every 3 months, this is the perfect time to use the AquaFinesse Spa Clean Puck to deep clean your pipework and surfaces. With the water still in the spa, open all valves, jets, blowers, water falls etc. Thoroughly cleans your spa from the inside out! 4.Repeat the pump activation process at least 2 - 3 times during the deep clean. Recommended treatment time is 12-24 hours. 1. 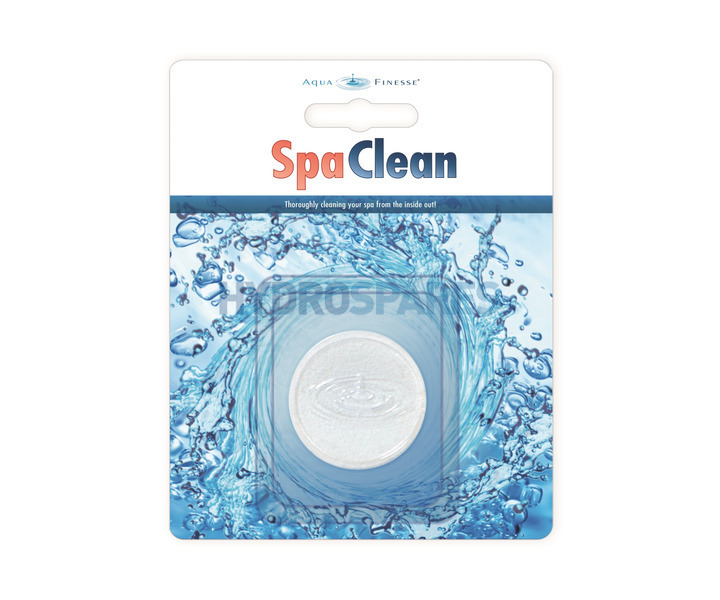 To save water you may add the Spa Clean treatment tablet directly to the water after bathing. 2. Once dissolved, activate the jets and air blowers for a minimum of 10 minutes. 3. Leave the treated water in the bath overnight. 4. In the morning reactivate the jets for a 20 to 30 minute period. 5. Empty the bath and refill with fresh water and activate the jets once again. 6. For best results follow with the addition a Pure-Spa Whirlpool Sanitising tablet or a small amount of Spa chlorine granules (available separately - follow instructions on the pack) then rinse the pipe work thoroughly, you may use cold water if you wish. 6. Your whirlpool bath has now been deep cleaned and is ready for use. Do not use the bath during the cleaning process. Your whirlpool bath should be deep cleaned following the above process every three months. Very pleased with the product, it is very efficient and easy to use. Does the job, deep cleans which is necessary when you do a total clean out. Is the Puck reusable or can it be used only once? The Spa puck is one treatment, it dissolves completely.